Facebook (NASDAQ:FB) has admitted to yet another potential data breach, saying it "unintentionally" uploaded the email contacts of up to 1.5M new users since May 2016. "Last month we stopped offering email password verification as an option for people verifying their account when signing up for Facebook for the first time. We've fixed the underlying issue and are notifying people whose contacts were imported. Ron, heelo is for sure in the right place at the right time. Today Pinterest is public today on the NYSE today under ticker symbol "PINS" after being priced above range at $19 per share and valuing the online image board at $12.7B. Zoom Video Communications, another multi-billion dollar tech company, is expected to list on the Nasdaq after pricing its shares - which will trade under symbol "ZM" - at $36. It's the next big test for tech IPOs. 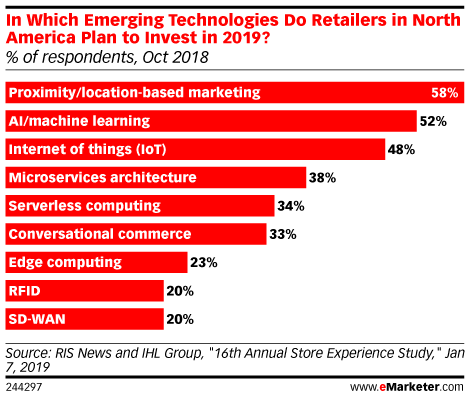 Latest eMarketeer survey finds retailers plan to spend the most on proximity marketing in 2019 but are leery about safety of personal data. They need to learn about Heelo that collects no personal data. Uber (UBER) unveils IPO, but warns it may never make a profit. I'm in for a bit more. I believe Roy is planning to meet with the lawyer this week to start process to print certs. We are going to do one final close on the financing at these prices after several sales contracts are announced. I will let everyone know. We must be close to the Certificates been mail out. Is there any time to add to our position? Thanks Ron. Getting excited to hear about sales for Heelo. Anything you can share?